Agate is a beautifully striped, finely grained gemstone that is found in a wide variety of bright colors and textures. Agate is a chalcedony quartz that forms in banded layers. It is often found in volcanic rock as a round nodule with concentric bands like the rings in a tree trunk. Some bands look like eyes, while others resemble scallops or landscapes. Some agates are hollow with the inner deposit consisting of quartz crystals directed toward the center forming a crystal lined cavity or geode. Agates are said to balance energies. They are known for protection of children, for imparting courage and for aiding in healing. In ancient civilizations people put agate in their drinking water to ward off sickness. In many traditions agate is believed to cure snake bites and scorpion stings. Persian magicians used agate to divert storms and still thunder and lightning. 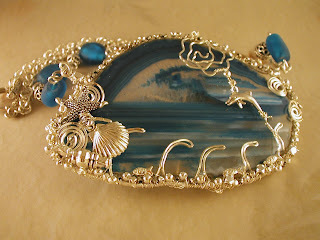 At The FamiLee Jewels we love using the many variations of agate in our work. Some of our favorite pieces are agate and geode slices that have been wrapped in copper or sterling silver wire.